On June 30th I took a train from Toronto to Montreal to go to Osheaga with my friend Jeff who was driving from Halifax to Toronto after a splitting from his fiancée. Jeff and his partner had moved out there five weeks prior only to have the whole thing fall spectacularly apart. A comedy of errors resulted in Jeff and I not actually going to Osheaga. On the drive from Montreal to Toronto (via Haliburton for some R&R) I said to Jeff, this is the best worst-case scenario. At least you know. Glass half full, right? Exactly two weeks later on August 13th, I was married. 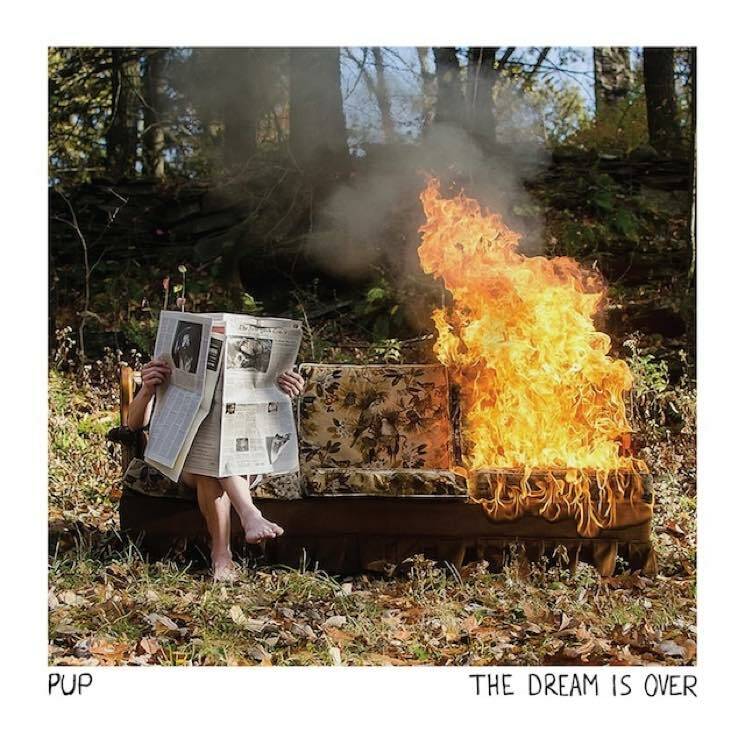 Sitting on the train to Montreal I was listening to PUP’s Polaris Music Prize shortlisted album The Dream Is Over thinking about Jeff and thinking about getting married and feeling guilty. “If This Tour Doesn’t Kill You” is the title and first line of the first song. The line finishes, “Then I will” and is delivered with almost no menace but feels brutally honest. Suddenly, I’ve replaced the word “tour” with “move” and Jeff is narrating his story angrily (and maybe a little hyperbolically – who can blame him) through my headphones accompanied. By the end of that first verse my stomach hurts. (“Counting down the miles ‘til we leave the state.”) Because “We” is “I” and the state is the province of New Brunswick (Jeff has been texting me at various intervals cursing the incalculable amount of trees in New Brunswick). “Doubts” opens with a deluge of bass and Jeff’s tragedy has become fuel for all the uncertainty that now propels him inexplicably forward (“It keeps me awake and it keeps me alive”) to destinations known (“I can go home and rest easier now”) and unknown (“So what’s left to lose?”). On “Old Wounds” to Jeff and his guitar are at their most belligerent and angry; the comforts of another relationship seem impossible. (“I’m bored of the games and bored of the chase. That’s the reason I left [Toronto] in the first place.”) Because much as he’d like to convince himself otherwise (“Don’t you know I’m over you?”), everything is still too fresh. It’s been over a month since the wedding and my guilt persists. Not because of the different trajectories of our lives exactly because Jeff will be fine; he is loved and he has support and he is one of the most resilient people I know. I feel guilty because this is cathartic. This unrelenting music feels good even though the protagonist/Jeff is suffering. The whole experience is unsettling and it is the same feeling I have when I listen to albums like Fucked Up’s David Comes To Life and Japandroid’s Celebration Rock. There is a timeless quality to angst and disillusionment that both transports me back to my high school days of soaring guitars and screaming front men and that grounds me in the present. The Dream is Over is about release. Even in the smallest of moments, before we move on, release is about as much as we can ask for. And it’s asking a lot.